The JSJ Locator is currently for those in the United States, if you are outside of the U.S. then click here. You can enter only the last name, however the more specific you are, the more narrow the search pattern. Using the name Test Pattern: You can search for Pattern, which would bring up all of those with that name. By inputing T Pattern, you would limit the search by that much more. If you enter the name Test Pattern you would limit the results to only those with that name. 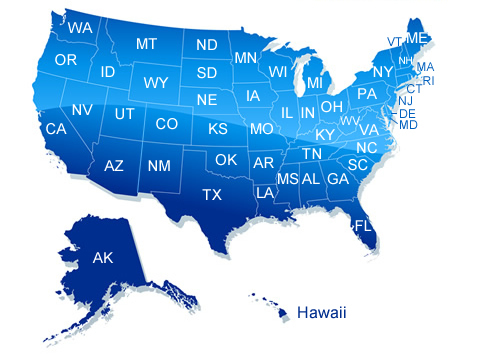 State map easy search, click on the state you would like to search. THE ABOVE DIRECTORY ON OUR WEBSITE WITH THE NAMES AND ADDRESSES OF INDIVIDUALS WHO HAVE COMPLETED AT LEAST THREE (3) BASIC FIVE (5) DAY SEMINARS OR REFRESHER SEMINARS OFFERED BY JIN SHIN JYUTSU,INC. (“JSJ”) IS PROVIDED BY JSJ AS A CONVENIENCE ONLY. THE INFORMATION IS FOR INFORMATIONAL USE ONLY TO ASSIST THE USER THEREOF TO CONTACT AND MAKE ITS OWN INDEPENDENT JUDGMENT WHETHER TO UTILIZE THE SERVICES OF THE JSJ STUDENT IN A GIVEN AREA. JSJ DISCLAIMS ANY RESPONSIBILITY OR LIABILITY FOR ANY DIRECT OR INDIRECT DAMAGES RESULTING FROM UTILIZATION OF A JSJ STUDENT AND DOES NOT ENDORSE OR APPROVE ANY OF THE LISTED JSJ STUDENTS AS TO THEIR QUALITY, RELIABILITY OR OTHERWISE, OTHER THAN THE FACT THAT SUCH INDIVIDUAL(S) NAMED HAVE SUCCESSFULLY COMPLETED THE MINIMAL CLASS REQUIREMENTS IMPOSED BY JSJ. JSJ PERFORMS NO TESTING OR EVALUATIONS OF THEIR STUDENTS. JSJ IS NOT RESPONSIBLE FOR ANY INCORRECT OR INACCURATE CONTENT POSTED ON THE WEBSITE OR IN CONNECTION WITH THE SERVICE, WHETHER CAUSED BY USERS OF THE WEBSITE, SUBSCRIBERS OR BY ANY OF THE EQUIPMENT OR PROGRAMMING ASSOCIATED WITH OR UTILIZED IN THE SERVICE. JSJ IS NOT RESPONSIBLE FOR THE CONDUCT, WHETHER ONLINE OR OFFLINE, OF ANY USER OF THE WEBSITE OR SUBSCRIBER OF THE SERVICE. JSJ ASSUMES NO RESPONSIBILITY FOR ANY ERROR, OMISSION, INTERRUPTON, DELETION, DEFECT, DELAY IN OPERATION OR TRANSMISSION, COMMUNICATIONS LINE FAILURE, THEFT OR DESTRUCTION OR UNAUTHORIZED ACCESS TO, OR ALTERATION OF, USER OF SUBSCRIBER INFORMATION. JSJ IS NOT RESPONSIBLE FOR ANY PROBLEMS OR TECHNICAL MALFUNCTION OF ANY TELEPHONE NETWORK OR LINES, COMPUTER ONLINE SYSTEMS, SERVERS OR PROVIDERS, COMPUTER EQUIPMENT, SOFTWARE, FAILURE OF EMAIL ON ACCOUNT OF TECHNICAL PROBLEMS ON THE WEBSITE, INCLUDING INJURY OR DAMAGE TO USERS AND/OR SUBSCRIBERS OR TO ANY OTHER PERSON’S COMPUTER RELATED TO OR RESULTING FROM PARTICIPATING OR DOWNLOADING MATERIALS IN CONNECTION WITH THE SERVICE. UNDER NO CIRCUMSTANCES WILL JSJ BE RESPONSIBLE FOR ANY LOSS OR DAMAGE, INCLUDING PERSONAL INJURY OR DEATH, RESULTING FROM ANYONE’S USE OF THE WEBSITE, ANY CONTENT POSTED ON THE WEBSITE, OR ANY INTERACTIONS BETWEEN USERS OF THE WEBSITE AND A SUBSCRIBER, WHETHER ONLINE OR OFFLINE. JSJ CANNOT GUARANTEE AND DOES NOT PROMISE ANY SPECIFIC RESULTS FROM USE OF THE DIRECTORY. EXCEPT IN JURISDICTIONS WHERE SUCH PROVISIONS ARE RESTRICTED, IN NO EVENT WILL JSJ BE LIABLE TO YOU OR ANY THIRD PERSON FOR ANY INDIRECT, CONSEQUENTIAL, EXEMPLARY, INCIDENTAL, SPECIAL OR PUNITIVE DAMAGES, INCLUDING LOSS OF PROFITS ARISING FROM YOUR USE OF THE WEBSITE EVEN IF JSJ HAS BEEN ADVISED OF THE POSSIBILITY OF SUCH DAMAGES. NOTWITHSTANDING ANYTHING TO THE CONTRARY CONTAINED HEREIN, JSJ’S LIABILITY TO YOU FOR ANY CAUSE WHATSOEVER, AND REGARDLESS OF THE FORM OF THE ACTION, WILL AT ALL TIMES BE LIMITED TO THE AMOUNT PAID, IF ANY, BY YOU TO JSJ IN RELATION OF THE WEBSITE. IF THERE IS ANY DISPUTE ABOUT OR INVOLVING THE WEBSITE, BY USING THE WEBSITE, YOU AGREE THAT THE DISPUTE WILL BE GOVERNED BY THE LAWS OF THE STATE OF ARIZONA WITHOUT REGARD TO THE CONFLICT OF LAW PROVISIONS. YOU AGREE TO PERSONAL JURISDICTION BY AND VENUE IN THE STATE AND FEDERAL COURTS OF THE STATE OF ARIZONA, CITY OF PHOENIX. YOU AGREE TO INDEMNIFY AND HOLD JSJ, ITS SUBSIDIARIES, AFFILIATES, OFFICERS, AGENTS AND OTHER PARTNERS AND EMPLOYEES, HARMLESS FOR ANY LOSS, LIABILITY, CLAIM OR DEMAND, INCLUDING REASONABLE ATTORNEY’S FEES MADE BY ANY PARTY DUE TO OR ARISING OUT OF YOUR USE OF THE WEBSITE IN VIOLATION OF THIS AGREEMENT AND/OR ARISING FROM A BREACH OF THIS AGREEMENT AND/OR ANY BREACH OF YOUR REPRESENTATIONS AND WARRANTIES SET FORTH ABOVE.